The outspoken judge who threw out Apple's patent suit against Motorola Mobility has called into question the entire US patent system, comparing patent litigants to violent beasts. Posner: "All their teeth and claws"
"It's a constant struggle for survival," Judge Richard Posner said in an interview with Reuters. "As in any jungle, the animals will use all the means at their disposal, all their teeth and claws that are permitted by the ecosystem." 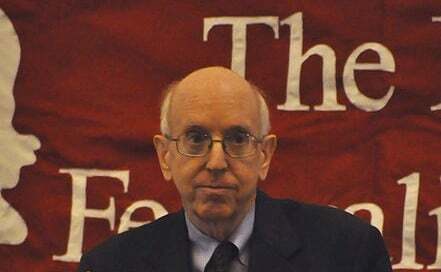 Posner feels the law of the jungle is flawed. "It's not clear that we really need patents in most industries," he said. Patents might be okay for pharmaceuticals, he said, because producing a single new drug might take many years. But innovation in software markets happens so rapidly that patent protection is probably not needed. In June, Posner ruled that neither Apple nor Motorola was entitled to an injunction blocking the sale of the other company's products, and that neither company had made a sufficient case to justify damages. He dismissed the suit "with prejudice," meaning neither party is allowed to file a new suit on the same matter. "It would be ridiculous to dismiss a suit for failure to prove damages and allow the plaintiff to re-file the suit so that he could have a second chance to prove damages," Posner wrote in his judgment. In his interview, Posner noted that smartphones are comprised of a multitude of component parts, and that under the current patent system each component receives patent protection. "You just have this proliferation of patents," he told Reuters. "It's a problem." Posner doesn't blame the mobe makers for bringing patent suits, however. Companies only naturally pursue whatever options are available to them under the law, he says. Yet Posner seems of a mind to curtail those options. He was given jurisdiction over the Apple-Motorola suit by a Wisconsin federal judge because he had made known his interest in patents. As for the mobile market itself, however, Posner maintains he is "really neutral."